It’s that time of year. The holidays are right around the corner, and before you know it, you’ll be hustling about trying to figure out what to get, or make, for who-and-who. We have a ton of herbs that are going crazy in this early fall weather that won’t last much longer, so I headed out and harvested as much as I could. While trying to decide what to do with the mounds of amazing smelling stuff, I got a great idea. perfect for tossing in your seasonal soups or stews! And perfect for gift giving this holiday season! The spiffy name for this creation is a bouquet garni – a collection of herbs collected together and used to flavor anything from a savory sauce to a pot of mulled wine. 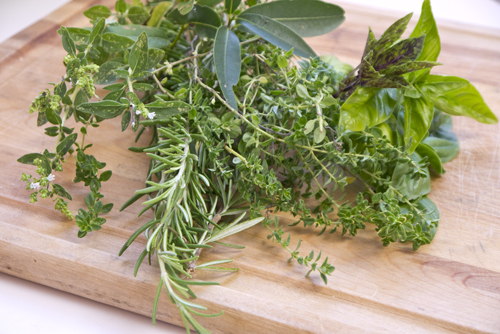 You can use any types of herbs you like, but traditionally basil, oregano, rosemary, bay leaf, and thyme are included. And I had a big pile of them all. 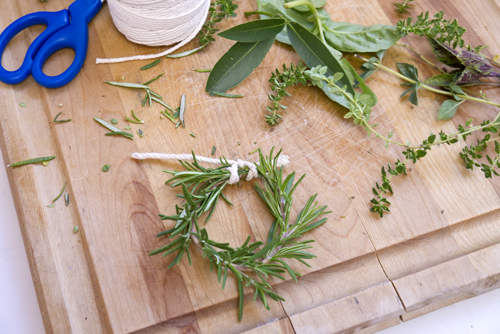 To create your own mini herb-tastic wreaths, gather up your favorite herbs. If harvesting your own, try to cut as long of lengths as possible, which makes the bending and forming easier. If you purchase the herbs, select the longest twigs from the packages. Start with a woody herb, such as rosemary, to create the base of the wreath. 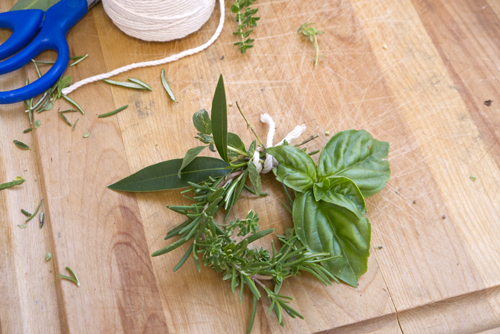 Gently bend together the rosemary and then secure with a length of cotton cooking twine. You’ll end up with a circle about three to four inches in diameter. Now wrap and weave the rest of the herbs into the rosemary. 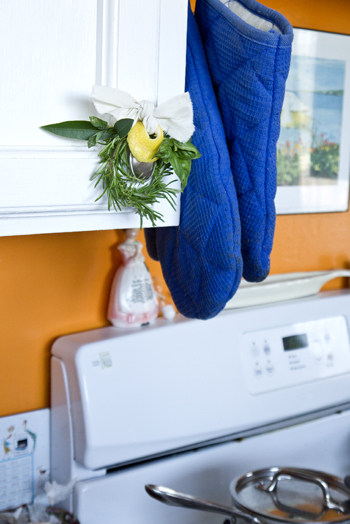 Lengths of thyme can be secured into the twine and then wrapped around the rosemary. Basil and bay leaves can be tucked in, and oregano lengths threaded in with the mess, too. Cut a section of cheesecloth (Don’t have cheesecloth? A piece of fresh, clean cotton, such as a man’s handkerchief, works wonderfully) that is big enough for the wreath to be placed in and secured with the length of twine. 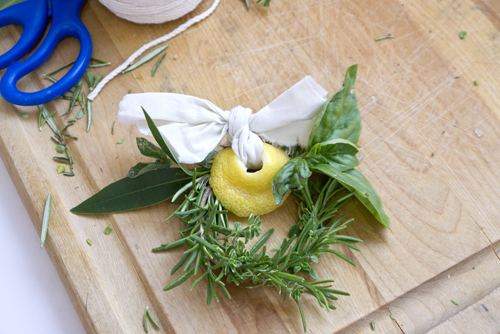 Fold it into a long section that can be used to tie at the top of the herby wreath. For fun, a round of lemon or orange rind can be added as extra decoration. As the wreath dries, it offers a lovely scent and something cute to admire. If giving as a gift, simply tie on a hand written name card or greeting and gently wrap in tissue paper. And, when the time comes to use the herbs, simply untie the cheesecloth and the twine, pop in the wreath, wrap up in the cheesecloth, and re-tie the twine. Toss in your bouquet garni and enjoy!